Platonic love. 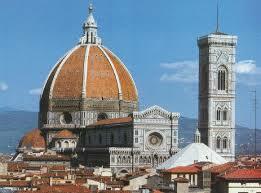 Renaissance and the architectural achievements of Brunelleschi, Florence, 15th century AD. 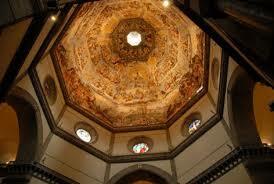 Brunelleschi’s SantaMariaFiore, built in Florence during the 15th century. The concept of universal harmony as it was understood during the Renaissance originated with Pythagorean and Platonic proportional systems found in geometry, music, and ultimately, nature (Koenigsberger, p. 173). The ideas of many mathematicians and philosophers were used in Brunelleschi‘s dome and Renaissance building techniques. ―Several examples of conceptions of harmony in theories of art and architecture, and also in suppositions about nature and reality, have been brought forward [by scholars].‖ (Koenigsberger, p. 173). Notions of harmony and beauty are integral aspects of the architecture and art of this period. One of the most important philosophical aspects of the dome is its shape. Although the dome is not a perfect sphere, it is intended to represent one. The spherical shape has many philosophical implications. The sphere is derived form the shape of a circle. The circle has been used to represent several key philosophical ideas in Renaissance culture. The origins of this philosophical context go back to the ancient Greeks, particularly the philosophy of Plato. What is important about the philosophy of the circle is not any particular circular shape. It is the universal idea of the circle that is relevant. There are certain properties that all circles possess. The line that forms a circle continues indefinitely on its prescribed path, symbolizing eternity. Eternity is an important concept in Christianity, so the circle was an important icon in Medieval and Renaissance art. The circle is also associated with God and Heaven, which are eternal according to Christian thought. Anthony Kenny conveys Plato‘s Idea of the circle in a nutshell: ―My subjective concept of the circle — my understanding of what ‗circle‘ means — is not the same as the Idea of the circle, because the Idea is an objective reality that is not the property of any individual mind‖ (p. 50). This statement can be better understood by exploring Plato‘s philosophy of Forms. According to Plato, everything in the physical world is a copy or shadow of a universal Idea. This world of universal Ideas or Forms is ideal and unchanging. The universals are Ideas themselves and the copies of the Ideas in the physical world are referred to as Particulars. One way to approach this philosophy is via Plato‘s cave analogy (cf. 521c-535a of Plato‘s Republic). Plato presented his concept of education by describing a cave in which humans are chained to a wall and cannot move. In front of them is a fire that provides light. Objects in the outside world, which the imprisoned ones cannot see, are reflected as shadows on the wall in front of them, so they can only understand the physical objects outside of the cave as shadows. In the analogy, the real objects outside are the universal Forms, while the shadows of the objects visible inside of the cave are Particulars. So the world of Ideas is more real than the physical world for Plato, but humans are shackled to the physical world, unable to fully experience universal Forms. Plato‘s philosophy parallels the concept of Idealism. The world of Forms is ideal, from which everything in the physical world is a copy. So Plato espouses the idea that the Ideal does exist, but humans cannot fully 6 experience it. Plato‘s philosophy was easily reconcilable with Christian thought during the Renaissance. For Renaissance thinkers, God is part of the ideal world, while humans inhabit the imperfect physical world.